When a player is outnumbered and has to cover two opponents, they will eventually be forced to stop the run of the ball carrier. Having drawn the opponent, the player can then give a handball to their free teammate, or dummy past the defender. This drill practices running in lines to get past a 4-on-2 contest. Skills under pressure, Decision Making, Run & Carry. afl training program, afl coaching tactics, aussie rules kicking drills for afl training program using these skills: kicking, handballing, tackle, shepherd. Rebounding defenders and centremen must instinctively run after their kick to provide support at the next contest. This drill involves a player who works on kicking and follow-up handball-receives before kicking at goal, and two other players who practice leading, marking and disposing to runners or leading players. GoalKicking, Kick Long, Handball Quick. australian rules kicking drills for afl training program with a focus on front & square, run & carry, goalkicking, hard running , free kicking drills for afl training program, australian football drills. It's very handy having smaller players in the team who are strong overhead and can take a mark up forward. This drill pits players of similar stature against one another in a marking contest to improve marking ability. afl training program, afl skills drills, aussie rules handball drills for afl training program using these skills: contested mark. Introduce some fun whilst practicing the basics of gathering a tumbling ball, kicking to leads, front and square positioning and goalkicking. Skills under pressure, Front & Square, Forward line delivery, Goalkicking, Fun. GoalKicking, Kick Long, Handball Quick, Crumb. 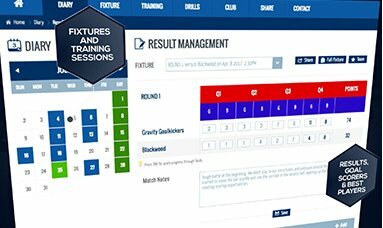 australian rules handball drills for afl training program with a focus on skills under pressure, front & square, forward line delivery, goalkicking, fun , free handball drills for afl training program, football coach training. This drill works the ball around in groups from a wing to defense to the opposite wing and finally to goal, with pressure from defenders requiring good decision making. Skills under pressure, Decision Making, Run & Carry, Forward line delivery, Goalkicking. 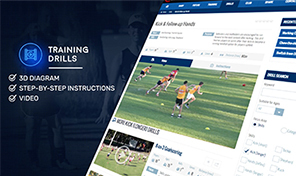 afl training program, afl workouts, aussie rules goalkicking drills for afl training program using these skills: kicking, handballing, goalkicking, contested mark, tackle, shepherd, crumb. Using the advantage of extra numbers around the contest, players must find a way to work the ball to a free player, who provides the releasing kick. A classic 3-on-2 break from defence, with the additional support of a shadowed midfielder. Skills under pressure, Defensive, Contested ball, Decision Making, Run & Carry, Forward line delivery, Goalkicking. GoalKicking, Kicking, Handballing, Tackle, Shepherd, Crumb. 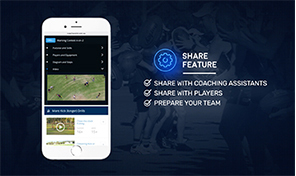 australian rules goalkicking drills for afl training program with a focus on skills under pressure, defensive, contested ball, run & carry, decision making, forward line delivery, goalkicking , free goalkicking drills for afl training program, pre season afl.